This condo sleeps up to eight guests with a queen-sized bed in the upstairs bedroom, twin beds in the second bedroom, a queen-sized bed in the third bedroom, and a sofa bed in the living room. From the living room and lanai, you will enjoy wonderful ocean views and nightly sunsets, as well as sweeping views of the grounds and pool. The pleasant island style furnishings and fully equipped kitchen provide an environment where guests can feel comfortably at home. For indoor entertainment, cable TV and DVD/CD player are provided. We do offer complementary wireless internet service, in-room safes, local calls & parking. Come join us in paradise! This is a non smoking/ vaping property. Loved the location. Our view of the ocean was spectacular. With no a/c would be hard to stay there in the summer. Only suggestion: GET room darkening curtains for upper windows in master bedroom and queen bedroom on first floor. Way too bright for sleeping after 6:30am! Mahalo for your feedback. We will definitely pass along the suggestion. We could not have wished for more! Our apartment was absolutely lovely. Very roomy with everything we needed and comfy beds! The view from the lanai was amazing, seeing whales everyday and also seeing turtles on the beach. With a bus stop out the front it was convenient to travel up and down the coast. Absolutely loved our stay and would highly recommend. Your family was a pleasure! Come see us again! Traveled with family and friends to celebrate my wife's 50th birthday. Our 3 bedroom unit with loft was awesome and met are needs. We checked in late at night and had an envelope waiting for us after hours with all the information we needed. The welcome note on the dry board was a nice touch. The beds were comfortable, the 3 bathrooms were extremely convenient, and having access to a laundry room on premises was very handy. The grounds and pool were fabulous, and I just can't say enough about the amazing sunsets. Not a major issue, but a fourth BBQ would be practical. We really enjoyed our stay and will definitely recommend this resort. Our rental was good for the price, location was great, and the property grounds were well maintained. We hope you had a wonderful reunion. Look forward to your next Maui visit! Brea at front desk was amazing! My group had originally booked an Airbnb but the conditions were not livable, forcing us to find other accommodations quickly. Brea was patient with us and helped us book a room which ended up being great! Would stay here again. Your group was awesome! So happy it all worked out! We enjoyed the experience, steps to the ocean. Pool never crowded and clean condo. We were travelling with 2 adults and 3 teenage girls. There was plenty of room and plenty of bathrooms to go all around. The view was amazing and the location was great. The grounds are kept up in fantastic condition! The loft bedroom was a bit warm, but there were plenty of fans to keep us comfortable. The office staff were very good at answering any questions we had. It would have been nice been nice to have a washer/dryer in the unit, but there were plenty available in the complex. We loved this place and would recommend it. An absolutely awesome stay at PS. Room description was very accurate. We found all items needed in the kitchen with lots of options. The property was clean and ready for our stay. We enjoyed snorkeling at four different beaches, zip lined on the north shore, took a snorkeling boat trip out to the crater, and enjoyed a wonderful luau. We would highly recommend Polynesian Shores. I was very pleasantly surprised with this condo. There were TONS of kitchen supplies for my big family. The upstairs area was very spacious with a small landing area. The 3 bathrooms were extremely useful. I really enjoyed my stay there. We enjoyed your family staying with us! We hope to see you next time you visit Maui! Aloha, We appreciate the details on the maintenance issues and have a comment card in the unit so that we can take care of these issues in a timely manner. We are pleased that you enjoyed your stay with us and we will take care of all of your concerns. We recently visited Maui and stayed at the Polynesian Shores. We had a three bed, three bath unit as there were six adults in our party. The unit had a very well equipped kitchen and was very nicely furnished, both inside and out. The grounds and pool were fabulous. The only disappointment was no sandy beach at the resort, but a very short walk away in either direction, were beautiful beaches to enjoy so it really was not an issue. Nice walk to a market loaded with gluten free items which was very helpful for us. I would highly recommend this resort, and this unit if you are travelling with others. We hope to visit again soon! Sounds just like we hope it will! Mahalo for staying with us! Nice unit, great location, great views, fully stocked. Couldn't be happier. Weather was less than ideal but we still had a great time. We truly enjoyed our stay at Polynesian Shores. Working with Bree was amazing and we felt our accommodations were in good hands with her. The unit was very clean as were the grounds and the pool. In fact they were immaculate. There were 6 adults in our party and there was plenty of room and our view from the lanai was a great way to enjoy the sunrise in the morning and the sunset at night. We were conveniently located near Lahaina so we could take advantage of activities, attractions and restaurants but came back to a quiet home environment. Thank you Bree, Jeff and the rest of the staff who took such great care. It was great! So happy to hear your vacation was wonderful. Mahalo for staying with us! Excellent location and great view! Our stay was good. Although it would have been nice to know that the place does not have any a/c. The winds do help but there are times where the wind doesn't blow and it gets hot. Lady at the front desk was wonderful and very helpful. We had a large hole in the ceiling of our daughter's room and some other smaller holes in the other room and she got someone to come a patch it up right away. The property manager was rude assuming that since there was 8 of us we rented a small condo and we were going to cram in. Then he asked which one our condo was, it was like he didn't believe us. Aloha, Mahalo for taking the time to let us know about your stay. We apologize for the hole in ceiling. This was there because prior to your arrival we had an issue with the upstairs shower (now fixed) and did not have time to repair the hole before you came. We appreciate you letting us get this done. We hope you will come and see us again next time you visit Maui! My parents staid here. They loved it with the kids. Very welcoming home. It does has quiet hrs from 10pm to 8am. No a.c but has many windows to keep cool. Only one parking is available. We had 3 cars but we parked out in the street. Congratulations on your marriage and mahalo for bringing your family here to Polynesian Shores! It was absolutely perfect. Check in was easy, condo was perfectly laid out. Amazing view and access to the water and pool. We would return to this place in a heartbeat. Pool is a bit small but this is not an overly large resort/condo community so it was never an issue. I will say it is not for everyone as there are quite a few rules but very enjoyable overall. The only thing I did not realize when I booked was lack of air conditioning and central air. Plenty of fans and ocean breeze, but would be concerned booking after April if temps rise. Mahalo for taking the time to give us your feedback. Beautiful and relaxing family get away. Everything was perfect. Clean, quite, beautiful view and great location. The location of unit 210 is spectacular. The view from the balcony/deck is wide and sweeping. The grounds are impeccable. The pool is great and having the access to grills is very handy. There is only a very small sandy beach for these units to the left after climbing over some rocks. The unit's interior is nice and was quite comfortable for six adults. The kitchen was well-stocked with plates, flatware, pots, pans, food storage and service bowls. The cutlery was quite dull so we purchased a small sharpener and left it in the unit. There are a couple of items that need addressing in the unit: the iPod docking station did not work, the internet did not work (was fixed, the only worked intermittently), and there are no pot holders. The queen bed in the downstairs bedroom needs replacing (sinks in the middle). The property's staff, with one exception, was very nice and helpful. 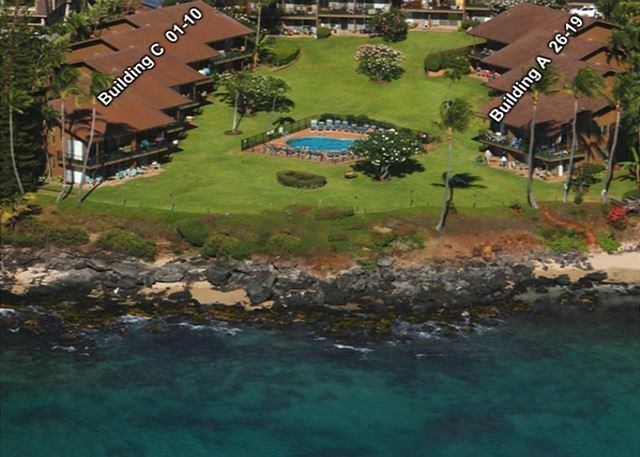 The location is about 5 minutes from Ka'anapali and 10-12 minutes from Lahaina. We saw a ton of sea turtles right in front of the property, which was very exciting! We could also see a lot of whales in the distance! Friendly people, great location, expensive. Kathryn D from Fairbanks, AK does not recommend this vacation rental. We had a fabulous trip. The location was great to see turtles and the sunset. It's close to Fleming state beach where the boogey boarders in our group loved to go. The unit needs some work. A deep cleaning and updated bedspreads, more pillows, better beach towels, throw pillows for the couch would be nice. The deck is great but so crowded with nice furniture it's hard to get around. We had a wonderful time overall but felt for $6,000.00 for 13 nights it would have been nicer. I really enjoyed the view. The upper bedroom did get a little warm. We had a great vacation and were very pleased with the property. The property manager, other residents and guests were very approachable, welcoming, and inclusive. They gave you tips and suggestions for things to do and see around the island, and there were numerous turtles (22 on one day!) that gathered on beach about 100 metres down from us. We walked to see them everyday!! It had a great view and you could sometimes see whales in the distance. We loved the layout of this unit, and it was very nice and clean inside. The only small issue was that the main sliding door to the balcony was quite heavy and didn't slide well. However, because it was a corner unit, it had a second access and that door was fine. We would definitely rent here again. We had a wonderful time. The condo was as advertised.